Great men are immortalized in alabaster or marble sculpture. 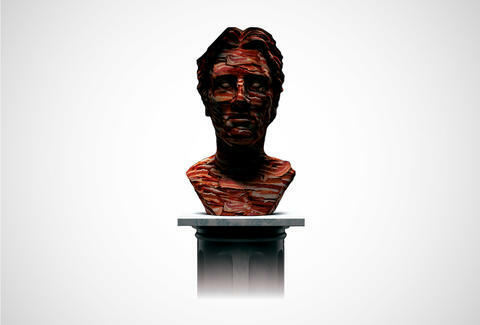 But the greatest have their busts rendered in bacon. And now you have the chance to be a god among men thanks to the Farmland Bacon Club, which is promising to craft a free, life-size meat bust of one member that signs up by June 15. Bacon-related giveaways have long been Farmland's game, though none have shaken up the art world quite like this before. And really, all you have to do to enter this contest is make an account. On top of putting you in the running for the statue, joining the club will give you access to recipes, tips, and videos from bacon fanatics everywhere. It's well worth it, considering all you ever got for joining the Sisqo fan club was made fun of. Kristin Hunt is a food/drink staff writer for Thrillist, and thinks the only man truly worthy of a bacon bust is Ron Swanson. Follow her at @kristin_hunt.